BEMSkel A lightweight responsive CSS framework using BEM and SASS for building component-based user interfaces. Written using BEM (Block, Element, Modifier) convention to make your front-end code easier to read and understand. Uses 7-1 Architecture pattern for maintainable and scalable SASS. Two ways of creating grids - CSS Grid and Flexbox. Only includes the most important features to minimize code bloat. Designed to be scalable and easy to customize. Use it as a standalone library or use it a starting point to build your next application. BEMSkel, or short for BEM Skeleton, is a lightweight CSS framework using BEM and SASS. It's designed to provide a solid foundation for building a component-based web applications and user interfaces. It is written using the BEM (Block, Element, Modifier) naming convention to provide a consistent and strict naming convention which allows you to divide your user interface into independent blocks and allow reuse of existing code. 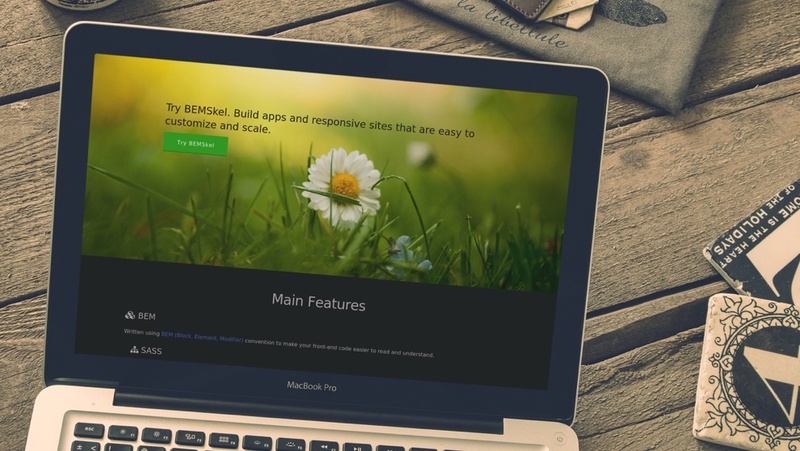 BEMSkel was initially based on Skeleton boilerplate but was rewritten using BEM and added with useful features for building component-based user interfaces. It provides styles for the most commonly used elements such as text, buttons, tables, and forms. It also includes two ways of creating grid systems -- grid and flexbox. As a simple rule, use grid if you need to support older browsers or flexbox if you only want to support modern browsers. Use flexbox grid if you only want to support modern browsers. In this kind of layout, the width of the columns are implicit, so columns will adjust automatically to be equal width to their adjacent columns. Type is all set with the rems, so font-sizes and spacial relationships can be responsively sized based on a single <html> font-size property. Out of the box, BEMSkel never changes the <html> font-size, but it's there in case you need it for your project. All measurements are still base 10 though so, an <h1> with 5.0remfont-size just means 50px. The typography base is Roboto served by Google, set at 1.6rem (16px) over a 2.4rem line height (24px). Other type basics like anchors, strong, emphasis, and underline are all obviously included. Different button styles are included in BEMSKEL -- classic, outline, raised, and large. Classic button styles are patterned after Bootstrap, which has 5 different color styles -- primary, secondary, info, warning, and danger. Button styles are also applied to a number of appropriate form elements but can also be applied to anchors with a .btn class. BEMSkel does not include an icon font, but works nicely with popular ones such as FontAwesome. You can use the <i> element to attach icons inside buttons. Basic form styles are included to help building forms easier. The pagination component provides default styling for pagination that contains long content and requires splitting content into shorter, easier to understand blocks. BEMSkel has a number of small utility classes that act as easy-to-use helpers. Sometimes it's better to use a utility class than create a whole new class just to float an element. This simple template is an example of how easy it can be to create a landing page using the BEMSkel grid and a few custom styles. The entire demo is ~170 lines of CSS including comments. Examples using BEMSkel with React will be added soon. © 2016 BEMSkel. MIT License.